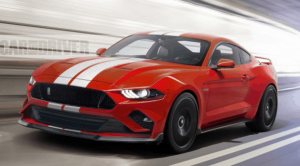 DETROIT: The all-new Shelby GT500 – the pinnacle of any pony car ever engineered by Ford Performance – delivers on its heritage with more than 700 horsepower for the quickest street-legal acceleration and most high-performance technology to date ever offered in a Ford Mustang. Arriving this fall to join its Shelby GT350 stablemate, Shelby GT500 is engineered to attack on all fronts. At the drag strip, it’s set to produce a projected 700-plus horsepower via its first-in-class dual-clutch transmission. Shelby GT500 starts with a supercharged 5.2-litre aluminum alloy engine built by hand. To keep the intake air cooler and deliver a lower center of gravity, the team inverted a 2.65-litre roots-type supercharger with air-to-liquid intercooler tucked neatly in the V8 engine valley. To channel power and torque to the unique carbon fiber driveshaft, Ford Performance leveraged learnings from the tuning of its Ford GT supercar’s dual-clutch transmission. A TREMEC® 7-speed dual-clutch transmission, which is capable of shifts in under 100 milliseconds – markedly faster than any manual gearbox. This dual-clutch transmission is designed for a number of drive modes, including normal, weather, sport, drag and track, and activates features like line-lock and launch control through selectable Track Apps. Two handling packages with increasing levels capability are offered for the all-new Shelby GT500. Shelby GT500’s purpose-built cockpit boasts race-inspired premium materials and unique finishes worthy of its world-class power. Premium touchpoints include an available exposed carbon fiber instrument panel appliqué and new door panel inserts in Dark Slate Miko® suede with accent stitching. Available Recaro racing seats with firm side bolstering and pass-throughs for safety harnesses offer the highest level of performance. For those looking for even greater comfort, power-adjustable seating with Miko suede inserts is offered. The all-new Shelby GT500 picks up a 12-inch full-colour LCD instrument cluster, SYNC® 3 with 8 inch LCD Capacitive touch screen, SiriusXM and FordPass Connect™ while a high performance custom-tuned 12-speaker B&O Sound system is available with the Technology Package. New colours for 2020 include Red Hot, Twister Orange and Iconic Silver. Painted stripes are available for the all-new Shelby GT500 too.